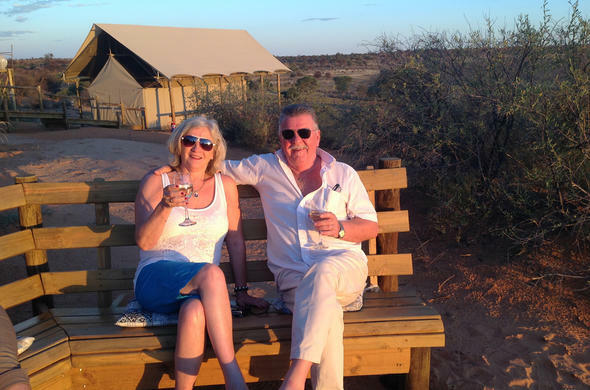 Kgalagadi Transfrontier Park accommodation offers luxury game lodges and tented camps situated amongst the stunning Kalahari desert landscape. 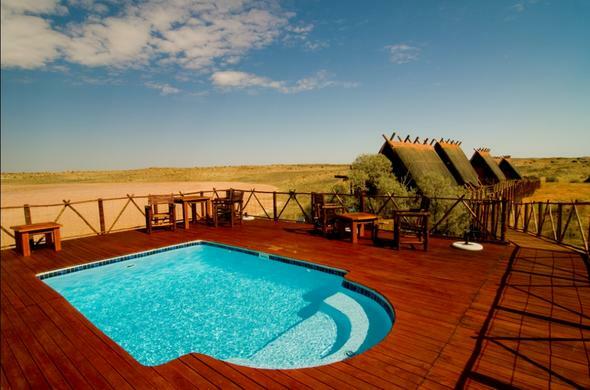 This lodge in the heart of the Kgalagadi Transfrontier Park, 60km north of Twee Rivieren, overlooks a vast salt pan and waterhole, sleeping 24 people in 12 luxury chalets. Guests enjoy wilderness walks, game drives and Bushmen interaction. Features include a lounge, library, hand-crafted furnishings and art, dining area, observation deck, boma (outdoor enclosure) and a swimming pool. Rooiputs is located about 25 km north of Twee Rivieren along the Nossob River Valley. The lodge has extensive panoramic views and lions often visit the adjacent waterhole. Accommodation comprises of 9 standard en suite thatched chalets, 1 family unit and 1 luxury desert / honeymoon suite with a romantic outside sunken bath. Each chalet is built on a wooden deck and has stunning views. Chalets have a main sleeping area with double or twin beds, a sitting area, en suite bathroom, outside shower and a large veranda. Lodge facilities include a lounge area, a bar, dining area, library; plunge pool, craft shop and a boma. Polentswa is a classic tented camp capturing the romance of a nostalgic bygone era, located 222km from Twee Rivieren along the predator rich Nossob Valley on the Botswana side of the Kgalagadi Transfrontier Park. All tents are set on raised wooden platforms under large canvas roofs that also encompass a spacious private veranda and an outdoor shower. 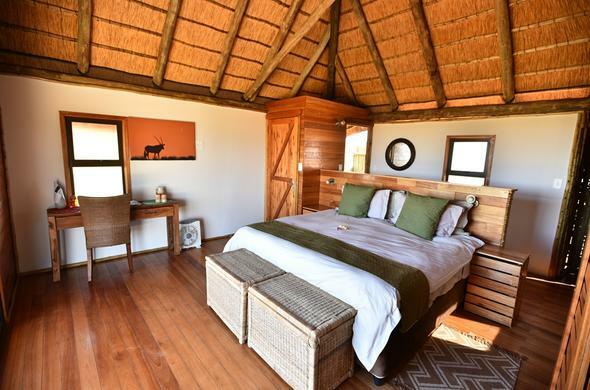 Accommodation consists of 6 luxury classic safari tents; 1 family unit; 1 desert/honeymoon tent with outside sunken bath. Each tent at Polentswa has a main sleeping area with double or twin beds with en-suite bathroom, a sitting area, an outside shower open to the stars. The open fronted main building overlooks a waterhole that attracts many species of game. Other facilities include a lounge area, bar, dining room, library, craft shop, boma and a plunge pool. Kgalagadi Transfrontier Park comprises different camps of varying size that offer excellent facilities. 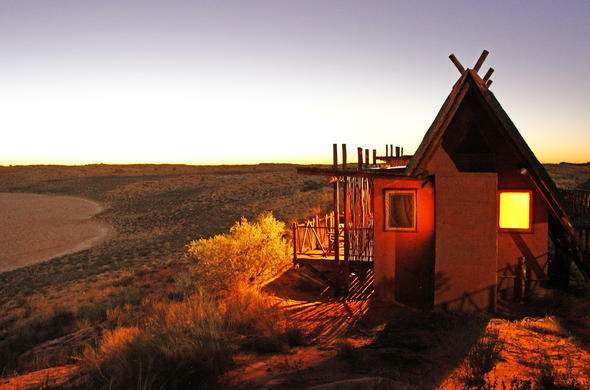 There are traditional rest camps, wilderness camps and the luxurious iXaus Lodge, which is overlooking a Kalahari Desert salt pan.